I spent the last two days (June 13-14th) attending the ARF Audience Measurement 6.O conference in NYC, particularly the social media insights panels. It was exciting to sit there and listen to how companies such as Cisco and Verizon are using social media, as well as how media planning and technology companies are testing findings to roll-out of various advertising methodologies. The following post focuses on some of the insights I got from some of the Key Note and panels I attended. Lee Rainie, Director of the Pew Internet & American Life Project, presented a keynote on how people use digital technology and how that makes audience measurement more complicated than in the past. Rainie listed out three revolutions – the Internet, mobile and social media, and then proceeded to discuss each in detail. A new dawn of social media?? What if I told you that there was a way to meet new people, get a great meal at a discount and all thanks to social media? A new tool has just put the social back into social media. I came across this great new tool called Grubwithus, very smart name, a Chicago based start-up. Grubwithus essentially helps brings strangers together to have a meal. You essentially go to the site, select the city you are in, browse through a list of dinners in their cities and buy tickets, usually for around $25. Before the event, you can share some information about yourself, just to know who you will be meeting. The NYT just wrote an article about it, and it sure sounds like a winning idea. Its been a while since I used a Charlie Sheen reference. The article rightly points out that as great as it is to share your life with your friends online and your professional pursuits on social media sites, we all crave face to face time. I also like the way they have established a relationship with restaurants, allowing them to control their customer flows and ensure they are booked on evenings when business may be slow. 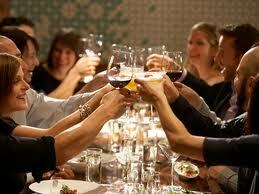 It’s also a great new networking/meeting tool if you are new to a city and want to meet new people. So at this point, I have just built a profile on the site. I might just go for one of dinners soon, and will report back on my experiences. What do you think, is this the dawn of social media and likely to see many more entrants in the market or just a one-off thing? 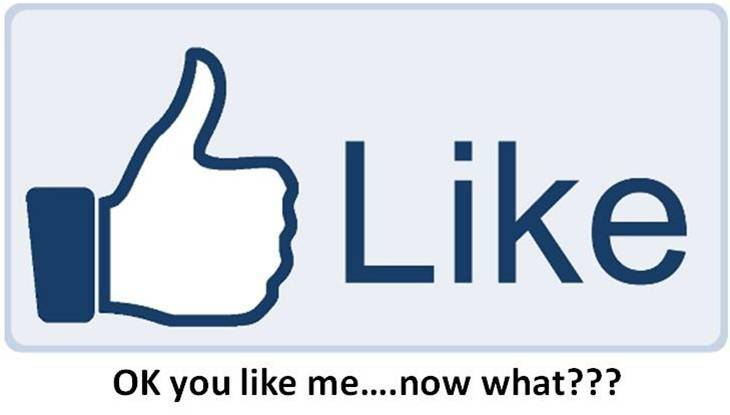 So your customer hits the like button on your Facebook (FB) page, your fan numbers grow and then what. This was the theme of an article titled – So you like my brand on Facebook. Now what? – on Adage. 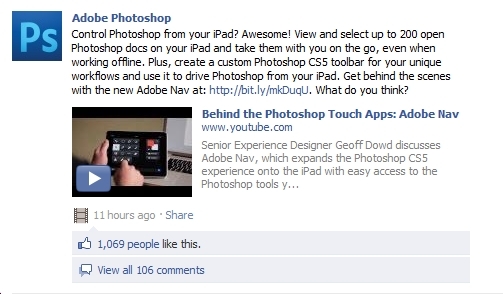 Adobe – Adobe Photoshop, currently has 2.18 million fans on FB, enlisted its product managed team to run its page. The team regularly asks fans what they want and learn what topics and ideas resonate with them. Thus far, Adobe has accumulated over 2 million lines and has over 3,000 comments. In addition, it regularly provides tips to get fans coming back to the page. Adobe has been able to use its page to not only drive engagement but also use it as a vital product development and crowd sourcing tool. Coca-Cola – The company takes a bold move towards engaging its FB fans by displaying user created content to drive the wall feed. The fan page was originally created by two fans, who just loved Coke. Rather than buying the page, Coke decided to work with them to build and represent the brand. Coke knows that its brand is an icon for consumers and most use collect and create art project out of it, so its photo album features user creations as well as pictures of its employee, and Coke products pictures from across the world. By creating a community where consumers can display their creative talent and share their connection with the brand is what makes Coke’s FB innovative truly unique. Link to the article. My perspective: Getting users to like your page is the first step, but it shouldn’t be the end purpose, it is a means to achieve your objective and it needs a focussed approach and the investment to make it successful. Social networking sites present an increasingly attractive way for companies to establish direct contact with a proportion of their customer base, market themselves, and build brand awareness. This post analyses four social networking sites – Facebook, Twitter, My Space, and LinkedIn – and discuss their potential as a marketing tool. Facebook (FB) – With more than 500 million active users, and 550,000,000 estimated unique monthly visitors in May 2011. FB is the largest social networking site in the world. According to statistics released by the company, half of its active users log in on any given day, spend over 700 billion minutes per month on Facebook and connect to 80 community pages, groups and events. FB also caters to a range of demographics including 18-24, and over 55, indicating the potential to use FB as a marketing tool. Companies or fans can create a product or brand specific page, and users can sign-up with the click of a button. Some of the elements that can be integrated on the page include engaging fans/members using regular updates and polls, posting pictures, designing special applications, featuring new product/brand and receiving feedback, running contests and giving out coupons, answering questions via the discussion forum, and by posting pictures and videos. FB users can also send each other gifts featuring a company’s product and/or brand prominently on their own page and these shows up in their status updates. 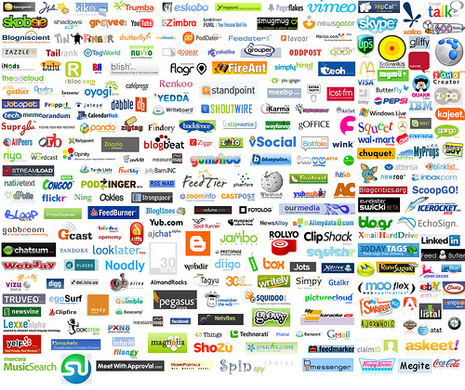 Given the diversity of applications, there are few barriers for companies to leverage the site irrespective of industry. The key is to keep the fan base interested and involved, with continued activity on the profile, ensure a distinct, coherent, and consistent message, and not force the conversation in any one direction. Twitter – Twitter is a ‘micro-blogging’ site. It is now the second most popular social networking site and had 95,800,000 estimated unique monthly visitors in May 2011. As compared to other sites such as FB and MySpace, some feel Twitter lacks dynamism, but there are benefits to this medium. Twitter is a good method to track the popularity of a company’s brand or product and stay part of the conversation. Zappos was the first company to use a Twitter aggregator that pulls in all mentions of the company on a page created on its site. This is also a way to promote the brand, people mentioning the brand, and display their experience. 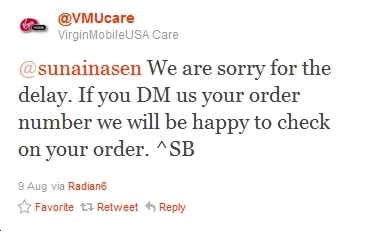 Twitter is also a good place to interact with customers, provide regular news, provide customer service, highlight offers, and provide new product information. In order to capitalize on Twitter, company representatives should establish a twitter account and begin to post regular updates on the site. It is also necessary to post engaging material to increase interaction with followers. Companies can track their followers, gain insight into their behavior. When using Twitter it is important to be responsive to tweets. MySpace – The third most popular social networking site, had 80,500,000 estimated unique monthly visitors in May 2011 . The site is skewed towards a younger demographic, and focuses on music and video content. Aquafina uses its profile to provide customers with entertainment and supports the independent film community – its profile features short film and it provides film festival updates, and had 8732 friends as of May 20,2011. By focusing on this targeted community, Aquafina has been able to generate intense brand loyalty and word of mouth. However, MySpace might not suitable for every business, and has up until recently seen a drop in popularity. In order to tap the site, it would be necessary to find an interest community such as musicians, gamers, filmmakers, or photographers and find a way to interact with them and build a loyal fan base. It is important to ensure minimal clutter on the MySpace page, as that is a common issue with the site, and acts as a distracting element. LinkedIn – The fourth most popular social networking site, LinkedIn had 50,000,000 estimated unique monthly visitors in May 2011. As compared to the other sites critiqued in this paper, marketing opportunities for companies using LinkedIn is slightly limited. The site is primarily used by professionals for recruitment, business development, and relationship development/networking purposes. All Fortune 500 companies have a profile on the site and represented by a variety of employees ranging from the CEOs to junior staff. The site is best suited for small businesses, which can use the “Full View” option to promote their organizations. Google prominently displays LinkedIn in searches and this can be very beneficial for small businesses, allowing interested parties to view a company’s profile. LinkedIn provides the ability to connect with sites such as the company’s blog, twitter account, and display company presentations. My perspective: Social networks provide companies with an interactive forum and depending on the marketing strategy, a host of social networking sites can be used to spread the company’s message. It is good practice to have a consistent message, and link various sites to the company’s home page and among each other to direct fans/users to content. Establishing guidelines is another very important task, and employees assigned to the task need to approach aspects such as posting comments, and links in a consistent manner.